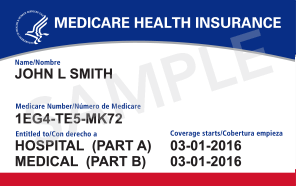 Have You Received Your New Medicare Card? This past April, the Centers for Medicare and Medicaid (CMS) began sending all of us on Medicare new Medicare cards. The reasons are to help protect us from identity theft and to help prevent Medicare fraud. Previously, our Social Security Number was our Medicare number. The number was printed on our Medicare card. Instead of our Social Security number, our new card has a Medicare number that is unique to each of us. First, look around to see if you have any old or unopened mail. Your new Medicare Card was mailed in a plain white envelope from the U.S. Department of Health and Human Services. If you still can’t find it, call 1-800-MEDICARE (1-800-633-4227). It may be because your correct address is not on file. Call center representatives can check your address and help fix the problem. In the meantime, use your current Medicare card to get the health care services you need. And remember, whether you have or have not received your new Medicare card, no one should be calling you to ask you to verify any personal information that is on the card.